ArchitectureChicago PLUS: Chicago Streetscene - Hanson Lives! Being woefully ignorant about pop culture, when I hear the name Hanson, I remember a band of three teen brothers that became a phenomenon upon bursting onto the rock scene in 1997 and imagine that, their 15 minutes of fame presumably expended, they've long since disappeared into a Bonaduce-in-the-making obscurity. 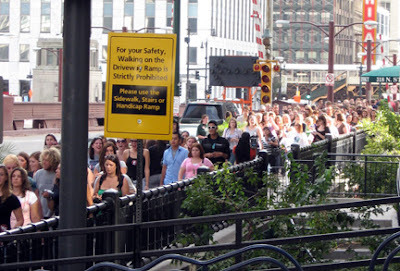 The adoring masses of teen girls descending on Marina City's House of Blues today proclaimed otherwise. Even as the brothers wrestle with the issues of geriatrics as they begin the steep descent into their mid-to-late twenties, they have apparently captured an entirely new generation of female followers, a thousand of so of whom followed the Hansons on a one-mile walk through River North, both touting their latest album, The Walk and, according to a Pollstar article to "help raise awareness of poverty and AIDS in Africa." "The trio has partnered with TOMS Shoes with the goal of delivering 50,000 pairs of shoes to needy children in Africa. For every pair of shoes purchased at each stop on Hanson's tour, TOMS will donate an equal pair. "We want to inspire others to look for simple, tangible and fun ways to make a difference," Taylor Hanson said. "It is easy to be halted by the great hurdles of poverty and AIDS, but making an impact can begin as simply as giving someone a pair of shoes or buying a song." Yeah, that kind of celebrity do-gooding, combined with album promotion, leaves the Hansons easy fodder for jokes, but cut them some slack. On a beautiful fall day, with teens, just at the point of getting a handle on what life might be, marching with their idols in solidarity of fan worship and social awareness, that's not a bad trade-off. I enjoy little slices of downtown Chicago like this. In case you are wondering, Lynn, keep sprinkling these stories in the blog. And no, I am not being sarcastic! Hanson's amazing new album The Walk is available at www.indiestore.com/hanson. I took the walk. I bought the shoes. And I helped some person in Africa. I rock.